Stay informed about upcoming construction work, terminal holiday schedules and other issues that may impact access to our terminals. Text NWSA TRUCKS to 468311 to receive updates via text message (message and data rates apply). Truck turn times at the NWSA terminals are available at PierTrucker.com. Click here to view the gate cameras. Starting Jan. 1, 2019, all trucks serving our international container terminals must have a registered RFID tag and a 2007 (or newer) engine, or a certified equivalent emission control system. Learn more about updates to the program. Find drayage providers serving our North and South harbors. Not on the list? Get added. Appointments can only be made by those who are registered for the terminal website (www.ttisea.com) as a Trucking Company with a valid SCAC code assigned to their profile. Please review the following instructions and contact Paul at 206-382-8251 for assistance as required. 1. Register for and log in to this website. A confirmation of website registration will be emailed to users during regular business hours of Monday-Friday 0700-1700 PST. 4. Choose an appointment date and then reserve a time slot by clicking on the calendar in the Appointment Date Select column. 5. SSCO holds, terminal holds and demurrage must be cleared in order for containers to be assigned at the in-gate. Maersk and Mediterranean Shipping uses Direct Chassis Link chassis (stenciled as DCLI) which are managed by Direct Chassis Link (Kate.Rounds@DCLI.com, 704-594-3754, www.dcli.com). All chassis, except for those chassis owned by an independent driver / operator or owned by an independent (non-PMA affiliated) trucking company, shall go through roadability inspection. Drivers seeking reimbursement for tire repair or replacement costs must bring the original receipt and tire casing (if applicable) to the M&R shop so that a casing receipt can be provided. Invoices are to be sent to TRAC Lease or DCL for their respective chassis. DVIR submissions must be made through Chassis.com. Submissions made by any other means will not be accepted (i.e. email, fax, hand delivery, verbal). Please visit https://t30.tideworks.com/fc-T30/home/default.do for container availability. Starting 1/28/2019 T30 will closed every Monday until further notice, T25 Matson will continue to operate as normal on Mondays. Dual and Reefer Transactions will not be processed after 4:00pm. The ingate will close at 4:15pm to service all remaining customers in our yard. Beginning Monday 6/25 T30 will start utilizing our pre-arrival function (Same as T18.) For any eModal Pre-Gate issues or questions please contact SUPPORT: helpdesk@eModal.com or (866)758-3838..
DO NOT deliver to Terminal until vessel appears above as authorized for receiving. All estimated dates are subject to change based on actual vessel arrival time. RTG (Crane Row) Import Containers, Rows D134 – D513 ONLY. Appointments will open on Wednesday, March 13th. No other Import transactions will require appointments at this time. Please continue to pre-arrive Export Load In, Empty In and Empty Out transactions. Appointments slots will open no sooner 5 calendar days prior to pickup beginning at 6:00 a..m.
Appointments for Monday begin on Wednesday 6:00 a.m. Appointments will be 60 minutes. Please cancel your appointment if you don't plan on using it to make room for others. T18 is currently receiving empties for the Steamship Lines listed below. Please recheck often as information changes constantly. NO LINING-UP OR STANDING TRUCKS ARE ALLOWED ON THE PUBLIC ROADS OUTSIDE T18 UNTIL 06:30 AM. TRUCKS THAT LINE-UP OUTSIDE TERMINAL 18 PRIOR TO THIS TIME AND BLOCK CITY ROADS WILL BE TICKETED. 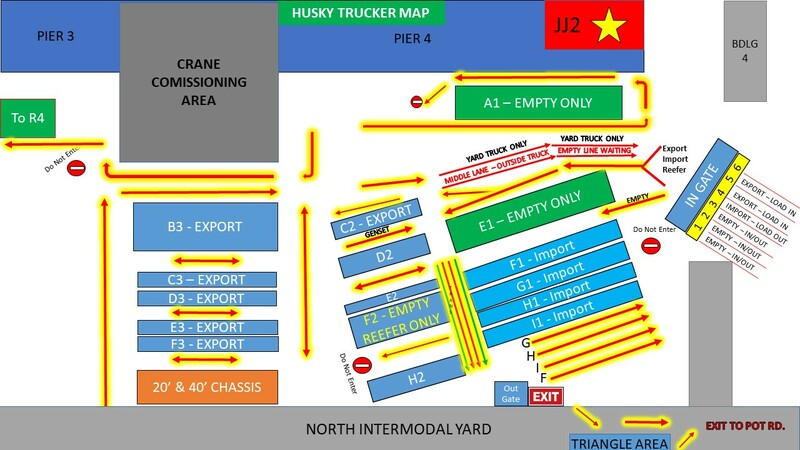 Pre-Arrival is Mandatory for all Export and Empty containers coming into T18. All Drivers without a pre-arrival on file will not be serviced and asked to LEAVE THE TERMINAL. For eModal Pre-Gate issues or questions please contact SUPPORT: helpdesk@eModal.com or (866)758-3838. It is recommended to confirm all equipment is On-hired with the SS Line prior to arriving at the terminal. PLEASE BE ADVISED THAT THE TRUCK PLATE MUST BE PROPERLY REGISTERED IN EMODAL. Use complete container numbers with Pre-Arrival including check digit. Starting Monday, 4/16/18, Terminal 18 - Gate 2 will only accept bare chassis and bobtail. Please note for import loads you now only need the last 4 digits/letters or both of the Bill of Lading. Example: 125SHA345AX 0123456789 SHA3605UVX02 etc. WUT's gate is open Monday - Friday from 8:00 AM to 4:00 PM. NOSEMOUNT GENSETS - LANES 8 & 9 ONLY! HAZMAT CARGO - LANE 3 ONLY! BOB TAILS - LANES 1 & 2 ONLY! WUT has changed our roadability lanes. Reefers can now get temp set in lanes 1, 4 or 5 rather than all waiting in one lane along with the other changes. On Dec. 17th WUT will be launching our new Terminal Operating System. We are hoping for a smooth launch but as you are all well aware, things can come up. We ask that you inform your drivers of this launch and let them know that if we encounter issues we will have staff here to work quickly through those issues. We ask that you all have patience and understanding. We understand that this is a very busy time of year and in order for us all to get through this smooth it will take cooperation from everyone involved. We will do our best to keep you all informed and if we encounter issues we will let you know as soon as they occur so please try to limit the number of calls to emergency situations and Trouble issues only with the understanding that we will be working diligently to keep the terminal moving. One major change that will affect the Trucking community is Trucker Access. We will still use our website (www.uswut.com), however, to access interchanges, container availability, future appointments (not currently required) and other information you will need to reregister. When we go live on the 17th there will be links on our website to access the new site. Once on the site you will see the below and can click it to sign up. Unfortunately you will not be able to do so before the 17th. 4 free days (excluding Saturdays, Sundays and holidays) after the vessel has completed discharge.Charges for the next 1- 5 days= $120.00 per day, and 6 + days = $175.00 per day. 2 free days (excluding Saturdays, Sundays and holidays) after the vessel has completed discharge. Charges for the next 1-2 days = $250.00 per day, days 3-5 = $300.00 per day, and 6+ days =$450.00. Please contact Evergreen at 972-764-1350 for any demurrage questions. Empty dry containers will be released against bookings and full dry exports will be accepted 7 working days prior to vessel arrival. Empty reefer containers will be released against bookings and accepted as export loads 5 working days prior to vessel arrival. Please check for container availability. 10/15/18 - TRAC CHASSIS LOCKOUT - TCT will not be receiving TRAC 40’ & 45’ chassis starting immediately per TRAC. Please tell your drivers to use the bare chassis release found on the TCT pedestal when they are gating in their return so they can gate out the chassis that they have. When trucks enter Pier 7 facility at Port of Tacoma Rd & 11th street, drivers will still present their TWIC to Port security. Driver makes the first left and then the second right and then the first left. There are signs directing the truck into the BOB TAIL ONLY LANE. Bobtails can still go to the main gate if they like. A truck with a chassis will not fit into this lane so please do not try. Trucks who are preforming a dual transaction at TCT (OCT) and Husky will have access to express lanes in Lot F.
The Express Lanes will be #9 & #10 lanes. Please note there is a bare chassis release for drivers posted at TCT intgate pedestal. 1. Complete their first leg of the transaction at TCT. Turn Right to the end of Thorne ST.
Then Turn Right onto 11 ST. Empty containers and Bare chassis need to be on the left side, closest to the rail road tracks on 11 ST.
Loaded containers, Reefers, Empty Reefers and Hazmat, need to be on the right side closest to jersey barriers on 11 ST. The Seattle Department of Transportation's weekly transportation construction update highlights the projects and events that may impact travel through the Seattle area. View this week's update. April 10 - May 8: Madison St. will be closed from Western Ave to Alaskan Way, 24/7. April 24: Seattle Sounders host the San Jose Earthquakes at 7:30 p.m. at CenturyLink Field. April 25 - 28: Seattle Mariners host the Texas Rangers at T-Mobile Park. April 26 - 27: 35th Ave NE will be fully closed between NE 75th St. and NE 90th St., Fri 6 p.m. - Sat 5 p.m.
April 28: Seattle Sounders host Los Angeles FC at 12:30 p.m. at CenturyLink Field. April 30 - May 1: Seattle Mariners host the Chicago Cubs at T-Mobile Park. May 4: Annual Opening Day of Boating Season parade will close the Montlake Bridge from approximately 10 a.m. to 4 p.m.
May 10 - 11: SR-99 Tunnel will be fully closed Northbound only, Fri 11 p.m. - Sat 8 a.m. If you have questions, contact construction.coordination@seattle.gov or call 206-684-ROAD. April 9 - 12 & April 13 - 14: The WB I-90 on-ramp to SB I-5 will be closed, nightly closures Tues - Fri 9 p.m. - 5 a.m. & Sat - Sun 10 p.m. - 8 a.m.
April 9 - 12 & 13 - 14: All lanes of the SB I-5 mainline will be closed at James St., traffic shifts to collector / distributer through downtown, Tues 10 p.m. - Fri 4:30 a.m. & Sat 11 p.m. - Sun 7 a.m.
April 12 - 13: Full closure of SB SR 99 Tunnel, Fri 11 p.m. - Sat 9 a.m.
April 12 - 14: Seattle Mariners host the Houston Astros at T-Mobile Park. April 13: Seattle Sounders host Toronto FC at CenturyLink Field, 1 p.m.
April 15 - 16: The SB I-5 collector / distributer will be closed at Airport Way, Mon 10 p.m. - Tues 4:30 a.m.
April 19 - 20: 35th Ave NE will be fully closed between NE 65th St. and NE 89th St., Fri 7 p.m. - Sat 10 a.m.
From WSDOT: Both directions of I-90 near the Vantage Bridge are now closed due to collision. Eastbound closed at MP 115 outside of Ellensburg and westbound at MP 137 near Vantage. Please take alternative routes US 97, I-82 or SR 243 to SR 24. Reminder: When entering the NWSA international container terminals, please make sure you have only one RFID tag in your truck. If you have more than one tag, you could be subject to a red light and be turned away at the gate. Dedicated safety inspection areas are located on or adjacent to every major NWSA container terminal.